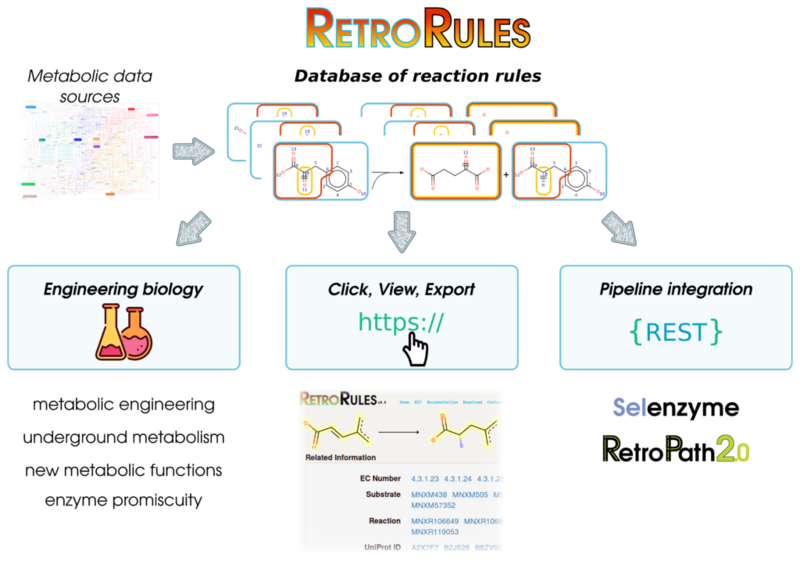 RetroRules is a database of reaction rules for metabolic engineering (https://retrorules.org). Reaction rules are generic descriptions of chemical reactions that can be used in retrosynthesis workflows in order to enumerate all possible biosynthetic routes connecting a target molecule to its precursors. The use of such rules is becoming increasingly important in the context of synthetic biology applied to de novo pathway discovery and in systems biology to discover underground metabolism due to enzyme promiscuity. Here we provide for the first time a complete set containing more than 400,000 stereochemistry-aware reaction rules extracted from public databases and expressed in the community-standard SMARTS (SMIRKS) format, augmented by a rule representation at different levels of specificity (the atomic environment around the reaction center). Such numerous representations of reactions expand natural chemical diversity by predicting de novo reactions of promiscuous enzymes. Duigou T, du Lac M, Carbonell P, Faulon JL. RetroRules: a database of reaction rules for engineering biology. Nucleic Acids Research, in press, 2018. ← RetroPath2.0: A retrosynthesis workflow for metabolic engineers, Metab. Eng.